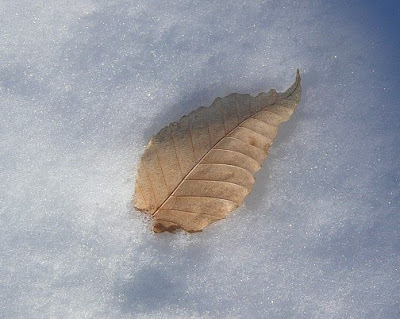 A single faded and almost transparent leaf is highlighted against the intense blue of newly fallen crystalline snow. The essence of wabi sabi, it forms a simple, stark and delicate composition on a bitterly cold morning. very serene photo. I love the tone of the ice cold blue. Cast-off leaves on snow allow us to appreciate their beauty all the more. really quite lovely. Crisp. Clean. I love the way you managed to capture the individual crystals of snow, the veins in the leaf, and how those both convey the utter stillness, silence and bone-freezing cold of a winter morning.